1. I resolve to bring in one new member to my club this year. Yes, just one. After all, how many did you bring in last year? This is a reasonable goal, and if every Lion does this--can you imagine? 2. I resolve to attend another club's meeting, fundraiser, or event at least once. Again, not asking for much here-just one time. If all Lions did this, think of the possibilities. We're all about helping-let's help each other. 3. I resolve to attend at least part of the 39W or MD 39 conventions. Have you ever been? Why not? The more people, the more fun. 4. I resolve to volunteer for something I've never volunteered for before. Maybe it's a committee in your club. Maybe it's to be the chair person of that committee. How about volunteering for a District position? Expand your horizons! 5. 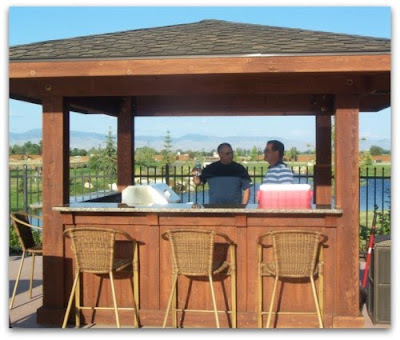 I resolve to attend __% of my club's meetings. You fill in the blank to increase your attendance. Our clubs typically have only 50% of their members attending meetings. You're missing out on educational and leadership opportunities if you don't attend, not to mention missing out on friendship and fun. OK, now it's your turn. Hit the "comments" link below and add your Lions resolutions. Then keep them. 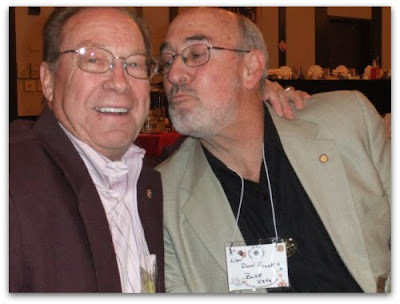 The Midwinter Convention has a new contest this year-the International Food Fair! Very appropriate since Lions Club is an international organization! This is a club contest, although if you are the only person in your club who wants to do it, go ahead and enter. That would be sad, to have only one person interested. But not as sad as having no entry at all! Anyway, pick a country, do a little research and find a few great recipes from that country, put together some table decorations, and bring your food on Friday night, February 11th, to the Courtyard by Marriott. You are free to bring any kind of food, but appetizers, finger foods, and desserts would work especially well. Clubs will be judged on food and presentation. Yes, there will be prizes! You can find the rules and entry form on the website. Several of my fellow Lions club members and I were chatting while warming after a service project this afternoon (it was chilly out there today!). This question was posed to one of our newer members: "Is this what you expected when you joined Lions?" While he was answering, I thought about what my response would be to that question-and for me, it was no, this isn't what I thought the Lions club would be like. No, not at all. As for our new member, he said, with a grin, it was pretty much what he thought. And for him, and for us, that is a good thing. 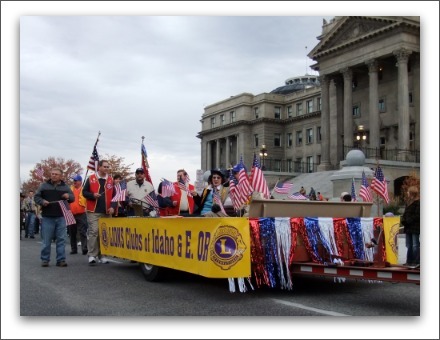 The annual Veterans Day Parade was held in downtown Boise on Saturday. 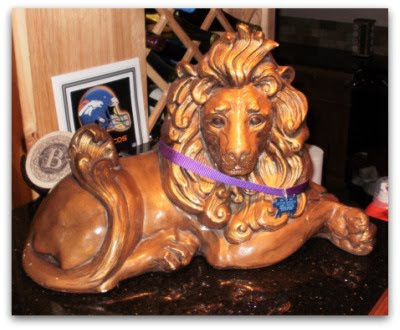 Thanks to Boise Bench Lion Happy Olsen, the Lions were again part of the festivities. 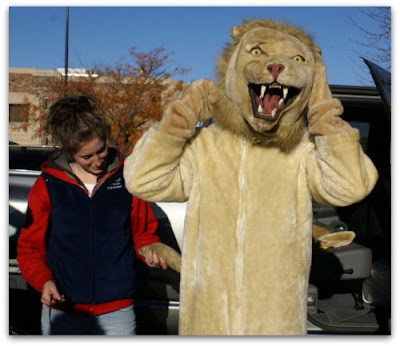 This year, the MSU (Mobile Screening Unit), a convertible with rodeo queens, a decorated flatbed trailer, and Lions and Leos on foot joined the procession. I wrote on this blog a year ago about the same event-a great way to say "thank you" to our Veterans and show support for our active military. 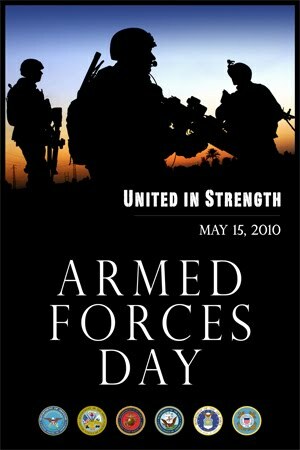 If you missed it this year, put it on your calendar now for 2011-you won't be disappointed. A golden gavel? I want one of those! 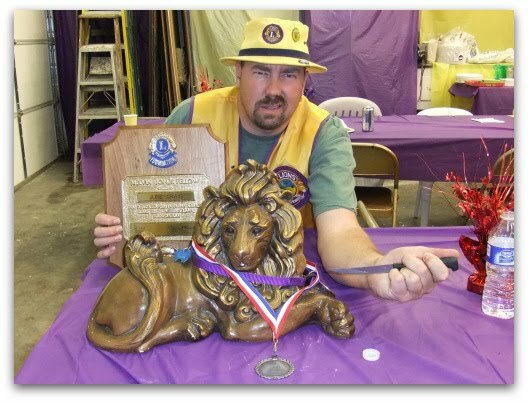 One of the new events for the Lions 39W Midwinter Convention this year is the "Quest for the Golden Gavel". It's a treasure hunt complete with coded messages and vague clues with a prize at the end-the "golden gavel", of course! You may be thinking that the convention is months away, and true, it's not until February. But the treasure hunt starts officially next week, with new clues available every week until the convention. Adventurous Lions can take a look at the contest rules and get a head start with the first clue at the website convention page. I'd been doing a little whining lately about so few events being on the Lions calendar. I knew Lions weren't taking vacations from serving their communities, but yet, the calendar remained nearly blank. Aha! 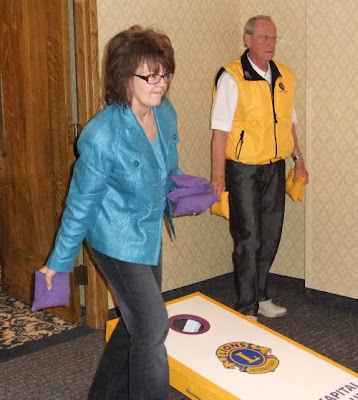 I've caught up with the Lions Clubs! They've been busy doing vision screenings! 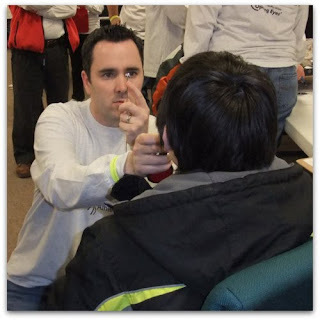 Lions clubs around the state are busy in the fall screening vision and hearing in the schools. Typically, they screen children in grades K, 1, 3, and 5, although some clubs screen other grades as well. 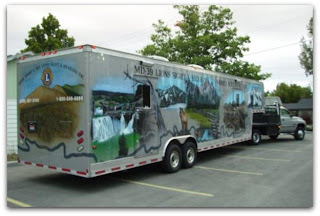 The Idaho Lions Sight and Hearing Foundation, the Foundation that belongs to and serves the Lions clubs, has a "Mobile Screening Unit" (MSU). The MSU travels around the state (and E. Oregon) and houses a sound proof hearing booth and several vision screening machines. Lions and other volunteers in the communities are trained in using the equipment. Thousands are screened in the fall and referrals made as needed. Do Lions screen in all schools? Not all-some schools have their own screening programs and some have probably just been missed. If you know of a school that would like the students' vision and hearing screened by the Lions, contact the Foundation office at 338-LION (5466). By the way, it's free. Now that I've added this information the calendar, everyone can see what the Lions are doing in their communities. And I'm not whining. You guessed it-more Lions cooking! 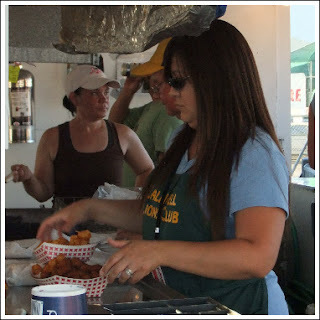 It's Caldwell Night Rodeo time and the Caldwell Lions spend a whole week cooking up burgers, dogs, steak fingers, onion rings, and tater gems (or tots as we Sonic aficionados call them). While the "Lion Dogs" and "Lion Burgers" may be a bit confusing for some of the smaller cowboys and cowgirls, everyone else is well-acquainted with the Lions booth at the rodeo. You want Tater Gems with that? I spent yesterday evening (what was it-nearly 100 degrees?) helping out the Caldwell crew along with DG Pat. 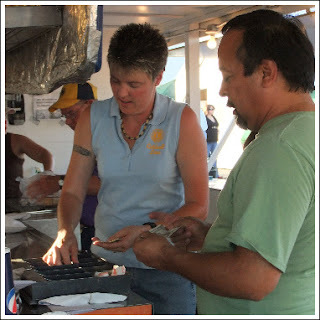 Tuesday isn't their busiest day, but everyone was still hustling to serve the hungry customers. You can tell they've done this before and are well-prepared for the bigger crowds to come. The Caldwell High School band helped out, selling sodas and water in the grandstand. Water was a big seller! Did I mention it was hot? You've got the rest of the week to head out to Caldwell, cheer on the cowboys, bulls, and broncs, and have some of those famous steak fingers to support the Lions! There were some great Lions events last week in case you missed them. Seems like Lions are great cooks. There's always a breakfast or dinner going on. The Gem Lions served the annual Buckaroo Breakfast to kick off the Gem/Boise County fair. It was a beautiful morning at the city park in downtown Emmett. The Lions served pancakes as big as your plate with all the other breakfast goodies. Then last Friday, the Kuna Lions made dinner for about 400 at Kuna Days. Hamburgers, hot dogs, chicken-no one should have gone away hungry! And no rain this year! Coming up next week are a couple more "Lions as Chefs" events. The Caldwell Lions have their food booth again this year at the Caldwell Night Rodeo, which starts next week. That is one crazy busy place to be and I don't think they'd turn down any extra hands! Give them a call! The Capital Lions are serving breakfast and lunch to the Optimist football players and coaches and they could definitely use some help this year with several of their club members out of town. If you have some time on Saturday, August 21st, contact Lion Tom Shores and offer your assistance. Let's all pitch in when we can. That's what being a Lion is all about! Know of another "food" event? Tell us in the "Comments" below! We currently have 1247 members in Lions District 39W spread over a very large geographical area, from eastern Oregon all the way east to the Twin Falls area. Ten or twenty years ago, it must have been pretty difficult to let everyone know what everyone else was doing, not to mention the cost of long distance telephone service or all those stamps! In 2010, though, we have a much easier time, with the potential of near instantaneous communication through email, blogs, and Facebook. Yet even those methods require some action on each end, because, so far, we can't read each other's thoughts. The current campaign to reach more Lions with timely news and announcements continues with the launch of the e-Bulletin. Actually, it's just email on steroids. What we've done is combined all the small emails that we might want to send out and all the event announcements with flyers, and added all the links that you might need, then wrapped that up in one pretty package. An added benefit is that ANY Lion can receive it, not just the presidents and secretaries that we've sent to in the past. So there's no reason for anyone to feel left out of the loop. So how do you get on the list to get the e-bulletin? Simple. Click here to sign up! It takes you through a couple of steps to verify your address and if you really want to join. (If you decide later you don't want to be on the list, unsubscribing is just one click.) I hope you'll try it out! Questions or comments? Click the "comments" button below. Lions District 39W hits the pages of Lions Magazine this month with a one page article "In It to Win It" about our recent membership contest! The magazine, which hasn't hit mailboxes yet, appears on the LCI website in an online magazine format. Pretty awesome! When DG Pat was campaigning for this position, the two things he emphasized to me were education and training for Lions and better communication. I think since then he's probably found many more things he'd like to do, see, or change in the coming year, but for now, my topic is communication. 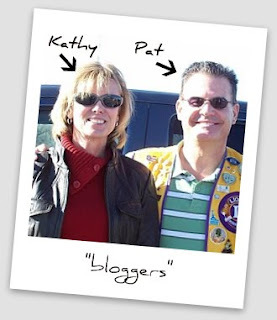 As the new Communications Chair (a pretty broad assignment) my job is to help District Governor Pat, the clubs, and all the members improve our lines of communication. Last year with District Governor Shirley, we launched the new website, adding more pages and information throughout the year. 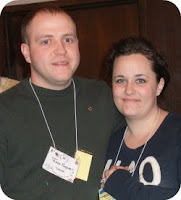 In November, we started blogging and added a Facebook page. These three things will be continued in the coming year. But we're not stopping there. Beginning in July (after we have the club officers updated), we will be sending out an e-bulletin, probably on a bi-weekly basis. This will contain event and party announcements, a calendar, notes and news-things you are used to seeing in your email. The difference will be a consistent format, no attachments, and the ability for any Lion to sign up or opt out. The next generation of Paw Prints, our newsletter, will also be premiering. With it's smaller size, it will be easy to print and send by US mail or distributed to the public. I'll be asking for feature story writers to help out-especially Lions in the eastern part of our district (hint, hint). As always, please be patient as we work out the kinks, and feel free to comment by clicking that blue comments link below. One of my "great ideas" this past year was to hold a photo contest on our website. I thought it would be a good way to get lots of really good photos from around the district that I could use for the website and blog. But now that we're at the end of the contest, I have to admit that this was not such a brainstorm after all. Maybe there should have been a big prize? 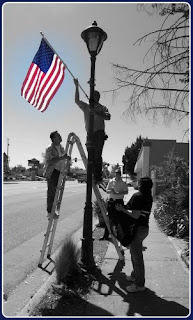 Anyway, thanks to everyone who sent me photos-Lion Curt Kelley, Lion Olie Olsen, DGE Pat Brown (who shares all his photos on Picasa! 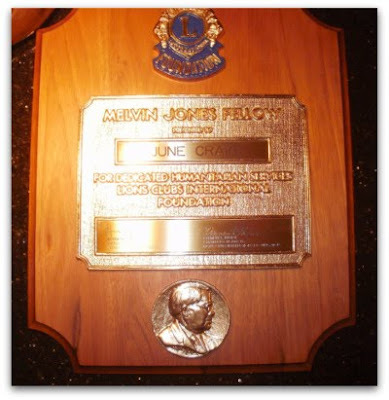 ), Lion Jack Graham, Lion Nancy Berto, PDG Laura Walls, Lion Stevie Beehler-for the contest or not. Keep sending-I can use your good shots throughout the year. I'd love to have photos of Lions in action! 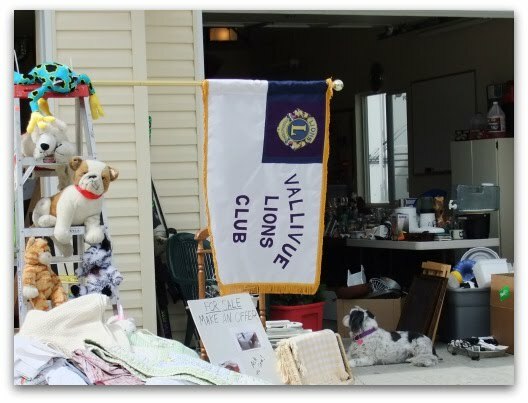 Ever wonder where all those old eyeglasses the Lions Clubs collect end up? 5000 pairs are heading to Africa to Mozambique, Congo, and Lesotho thanks to the Lions Sight and Hearing Foundation and Mission Aviation Fellowship. The effort made the news last week with stories on KTVB, Channel 7, and this week on KTRV, Channel 12 and KIVI, Channel 6. Don't miss reading the complete details on Mission Aviation's website. Lions collect all shapes, sizes, and prescriptions of used eyeglasses. 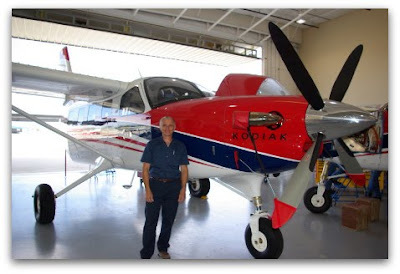 Those in good condition are sent on missions like this one to developing countries. Others that are no longer wearable can still be recycled for parts and metal so don't hesitate to put your old pairs, including prescription sunglasses, in the collection boxes. 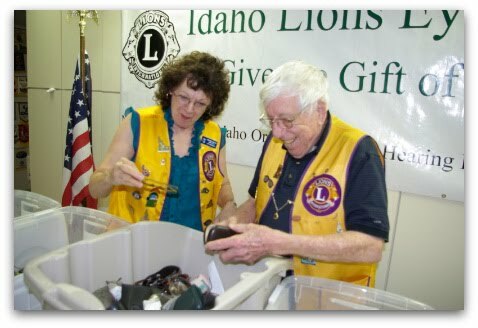 The boxes you see at Walmart are sent to regional Lions Eyeglass Collection Centers for recycling through a new partnership between Lions Clubs International and Walmart. The glasses collected in the small boxes that you see in various locations are used for the local missions like the one from Boise to Africa. Carolyn Holly's KTVB blog lists several sites in Boise where eyeglasses can be dropped off and several more around the state are listed at our Lions District 39W website. If you know of a collection site not listed, you can list it by clicking the blue comments link below or contact us through www.Lions39W.org. 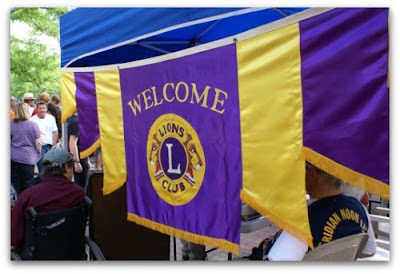 Lions from several Boise area clubs hosted a booth at Wednesday's Alive After Five in downtown Boise. The idea was to gain some exposure for Lions and possibly get a new member or two. 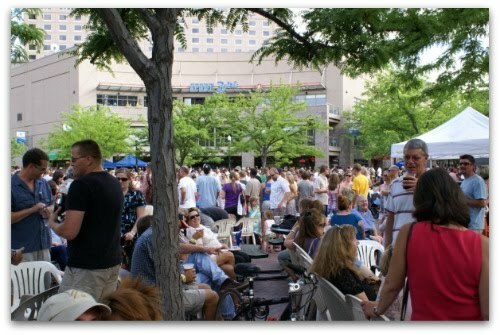 If you've never been to Alive After Five, it's Boise's summer concert series at the Grove Plaza. But it's more than rocking to the music. It's the place to see and be seen, the place for kids to cool off in the fountains, the place to have some pizza and beer...if you don't mind waiting in line! The Lions had plenty of brochures to hand out to the people who stopped to talk or turn in their tickets for a raffle of Idaho Monopoly games. Several people signed up to receive more information-maybe they will become Lions some day. Or maybe they will just have a better appreciation of the work that Lions do. It's all good. 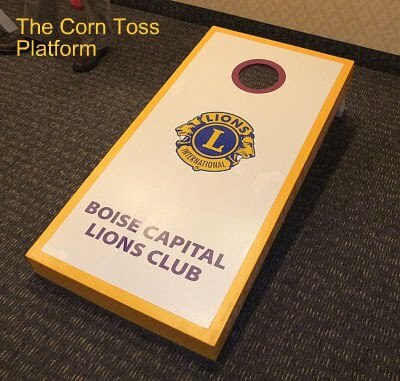 Thanks to the Idaho Business Review who are generously sharing their booth space, Lions will have two more opportunities to meet and greet, on July 28th and September 15th. Sign up for a shift and you may find a new Lion! 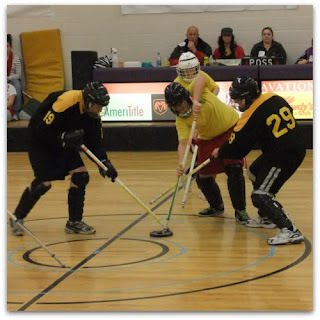 Photos from Olie Olson, Boise Bench Lions. (The guy who always has a camera!) Thanks! In the June message to Lions from International President Wirfs, he summarizes the successes of his 2009-2010 platform "Move to Grow" which focused on increasing membership. He reports that LCI numbers have increased by approximated 58,000 through May with all constitutional areas reporting growth except Canada and the US. One thing I found particularly interesting was the number of women members. Out of just over 1.35 million Lions, only 298,592 are women. This made me wonder how our District 39W fares in men vs. women, so I went to the LCI report section to find out. While our ratio is better (that is, a larger percentage of women) men still out number women by a margin of 2-1. Well, this definitely got me to thinking...Ladies, we need to do something about this discrepancy and invite more women to join Lions. Take a look at your club-could you use a few more good female members? President Wirfs makes good point about keeping members. Before you drop a member (male or female) at the end of June, take a moment to give them a personal phone call and tell them you care about them. They may just decide to stay. 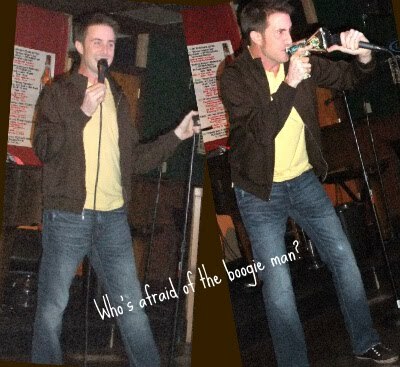 Need something interesting for you next club meeting? How about a short video from Lions International? Videos from LCI are available in several formats and are a great way to tell your club members about Lions International, the Lions Clubs International Foundation (LCIF) and about Lions Club projects around the world. There are free DVD's you can order from LCI. There are also videos available on the LCI website that you can download or watch through i tunes, youtube, or as podcasts. Lions Quarterly Video Magazine is posted four times a year and is a good source of ideas for new club projects as well as being inspiring and motivating. And don't forget our own Lions Sight and Hearing Foundation has a great video about the work of the Foundation. If your club hasn't seen it yet, contact the Trustee for your area or call Lion Jay Lugo at 338-LION (5466). Oops, did you forget your PU 101? My PU what? The PU 101 is the name given to the officer reporting form that LCI (Lions Clubs International) requests that you fill out to report your incoming officers. It is available online on the LCI website and either the club secretary or president has access and can submit it. The due date was May 15, but if you missed the deadline you can still submit it-and the sooner the better! By submitting your new officer information, your club secretary and president will be given a password that they can use to submit the monthly membership and activity reports. They will also receive the LCI communications that are sent out periodically. And it's not just for LCI-your District Governor and Communications chairperson will also have the information so your club will be in the loop with what's happening in the other clubs and around District 39W. If you have any problems submitting the info, contact your friendly IT Chair through the website. Or submit a comment below. 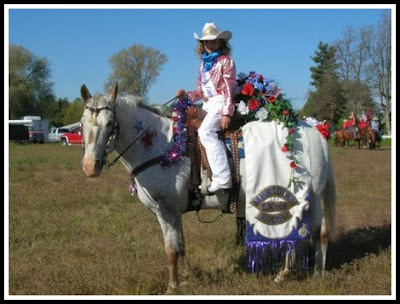 In April, the Meridian Lions Club held the Rodeo Queen Contest and since then the queens, Senior Queen Tricia, Teen Queen Melissa, and Mini Queen Tevis have been participating in parades and at events around the Valley. The queens are available to make appearances, help out with events, and, in general, promote the Lions as well as the Meridian Lions Rodeo. 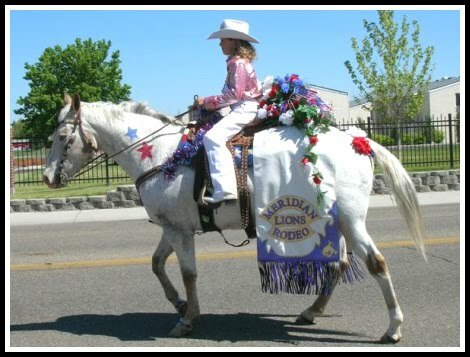 These two photos are Mini Queen Tevis at Parade America in Nampa. The Queens were also were hostesses for Celebration Park's 20th Anniversary in Canyon County and Teen Queen Melissa greeted the runners at the High Desert 10K Run in Kuna. Thanks to Lion Stevie Beehler for the photos and information about the Rodeo Queens! Remember how much fun you had at camp when you were a kid? Now it's time to go back-this time as a volunteer! 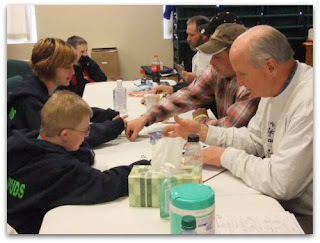 Lions stepped up to help the Winter Camp for the Blind with monetary donations. This time we need to donate our time to help the Summer Camp, sponsored in part this year by the Idaho/E. 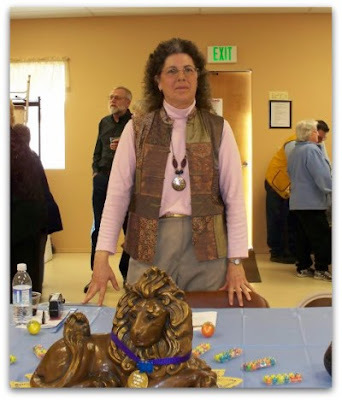 Oregon Lions Sight and Hearing Foundation. Volunteers are needed to help with various activities, including a talent show, a track meet, roller skating, rock climbing, horseback riding, and many more camp activities. The Summer Camp take place at the Idaho School for the Deaf and Blind in Gooding, Idaho, as well as sites in Hailey, Meridian,Shoshone Falls, and Twin Falls over the week of June 13th through the 19th. You can volunteer for a day or the whole week! And if you can't volunteer your time, money is still gladly accepted, too! If you can help, contact Ron Gill at 221-5668 for a complete list of volunteer opportunities. Last call for membership contest! It's the final week of the District 39W membership contest! Only a few more days to sign up those wannabe Lions-c'mon, you can do it! There have been some rumors floating around that one club has signed up 8 plus new members, another with a 30% increase, still other clubs aren't saying... We'll know pretty soon who wins the 2 nights stay in Sun Valley and convention registration, and if any of the rumors are based in fact. No matter who gets the prize, adding more dedicated Lions to our clubs is a win for all of us. Recruiting is a year around priority, and the contest has put a spotlight on membership growth. The new members you've added will bring new ideas to your club, lots of enthusiasm, and more hands to provide service to your community. The next challenge is to continue adding new members after the April 30 contest deadline. And just as importantly, keeping all the members you have. Share your ideas for membership with the rest of us! Click the "comments" link below. Have you filled out the convention survey? 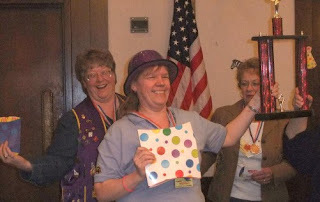 The committee for next year's 39W Midwinter Convention, chaired by Lion Linda Clemenger, is actively seeking input for the 2011 convention. They've come up with a short survey which is basically 2 questions: "If you didn't go to the 2010 convention, why not?" and "What break-out sessions would you like to go to?" A few choices are listed to get you started thinking, but there are three spaces to fill in your own ideas. After you've completed the survey, you'll end up back on the same page where you can scroll to the bottom and write in anything you want in the "Convention Ideas". Got an idea for Friday or Saturday night entertainment? Who would you like to hear as a keynote speaker? What do you think of the food? The cost? The time? The place? Do you want more education, more socialization? Write as much as you want on anything having to do with the Midwinter Convention. Never been? Doesn't matter. Always go? All the better! Click here to get started! 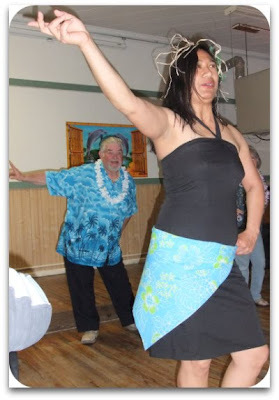 Whose Charter Party have you been to lately? Lots of Charter Parties this month! Hats off to the District Governor and Vice District Governors for attending so many functions-don't know how you do it! Let's just say you had to have been there. 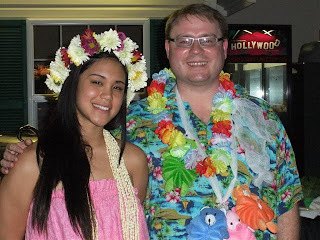 Not to be forgotten, Kuna's Charter Party last week was tropical fun! Something I've been wanting for my club is a brochure. We always order the free ones from Lions Clubs International which give general information about Lions Clubs and Lions and look really nice. But wouldn't it be nice to have a great looking brochure with your clubs specific service projects listed and days and times of your meetings? Well, silly me, LCI has an online template available where you can do just that. All you have to do is type in the changes online and print! You can change any of the pre-written text or just add your specific club information. Buying some nice paper and using your color printer would look pretty nice, or you could take it to your local print shop. It's on my "to do" list! What a great recruiting tool this will be! Do you have a club brochure? Fundraiser or Membership Drive in Star??? BEWARE!! The Star Lions club has been operating outside the guidelines of proper new member recruitment, and now are officially placed on probation. 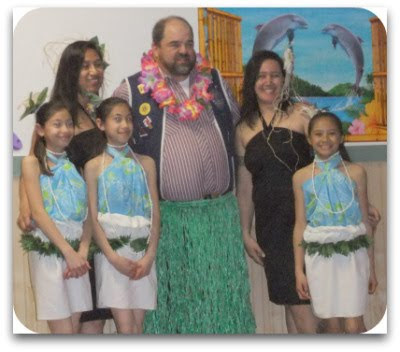 Their so called fundraising events are really a cover for recruiting new members. 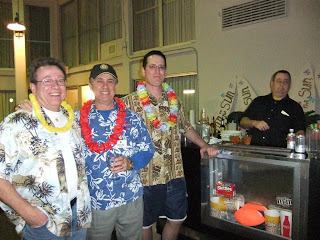 They offer great food, beverages and superb musical entertainment in return for a signed new Lion member agreement. This strong arm attempt at membership growth should not be a direct reflection of the Lions of District 39W. As you can see by the picture a couple of reliable spies from other clubs were the ones that brought this offense to our attention. Please beware of the Star Lions as they are on a mission to win the district membership contest by any means possible. 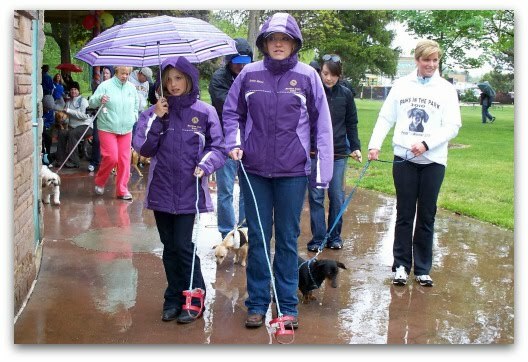 Lions do a lot of volunteer work and it's not always just Lions Club projects and activities. 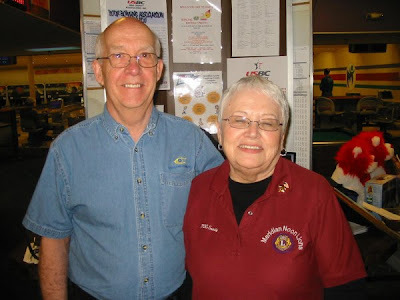 Take Lions Pat and Glen Gore with the Boise Riverside Club. 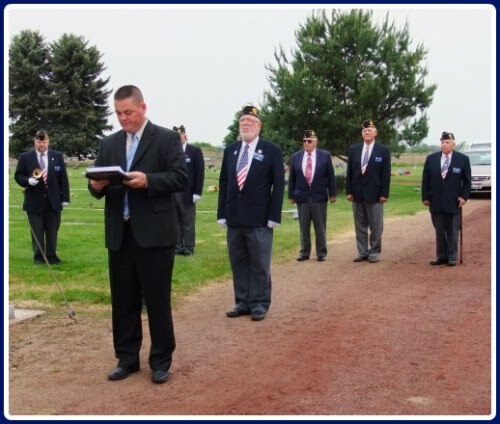 In addition to serving in their Lions club and attending many events hosted by other clubs, they are also involved with the Veterans Resource Network, which provides care packages for the military serving overseas along with other Veterans' projects. The Gores and the other volunteers are in need of a new place to house the organization and store items to be sent in the care packages. You can read more about Veterans Resource Network and what type of space they are looking for in Sunday's Idaho Statesman's Helping Works. I've been searching around for something to blog about this week and today was emailed a bit of interesting information. It seems the Vallivue Lions are at it again. 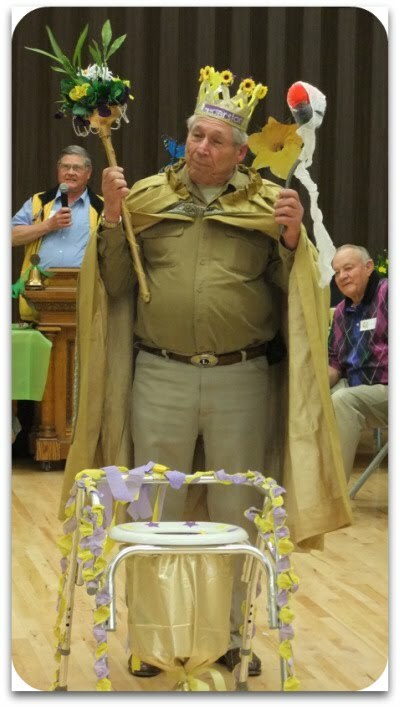 Back in October, several members of the Vallivue Lions visited the Star charter party and made off with a framed award that had just been presented by VDG Pat. They demanded that a Star Lion or 2 visit their club to retrieve the certificate. Star Lions played along. VDG Pat printed a replacement award, and he and a few Star Lions made the trek to the Vallivue Lions Den with the "fake" award for laughs and a pie to exchange for the original award. All I can say is that Vallivue better have everything nailed down! How did such a large lion find its way to Vallivue? Times are tough. Budget cuts are looming around around the state of Idaho as the legislature begins its session. I'm not getting on a soapbox about where the money should or should not be spent in Idaho, but I want to bring to your attention a potential shortfall that would affect some folks near and dear to the hearts of Lions-the students at the Idaho School for the Deaf and Blind. Each winter the school sponsors a winter camp for kids. Additional funds that may be needed this year would cover transportation and lodging costs of kids going to camp. The money in jeopardy amounts to about $2,300. The Star Lions Club has pledged $100 (through club and individual donations) to help with the transportation costs to send the kids to camp. They are issuing a challenge to the other clubs of District 39W to pledge at least $50 for this cause. "Alone we can do so little; together we can do so much." Yes, that was Helen Keller who said that. 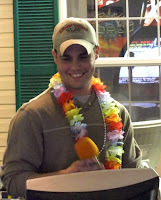 Check out page 50 of this month's (February 2010) Lions Magazine. Idaho-Eastern Oregon Lions Sight and Hearing Foundation is in print.... Pretty cool!!!! 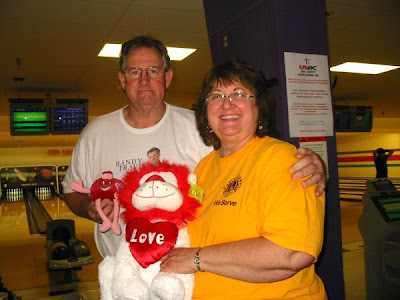 Lion Mary passed away on January 14th after fighting a courageous battle with cancer. Please join us in celebration of her life by attending the memorial service. We will be meeting at the Lions Eye Bank at 8:45 am., Friday the 22nd to carpool over. Please keep Lion Aaron and family in your prayers. Lions have lost a beautiful spirit, but now she is at peace with our Provider. We love you Lion Mary. Governor Otter declares January 13th "Idaho Lions Day"
Governor Otter has issued a proclamation declaring January 13th (the birth date of founder Melvin Jones) Idaho Lions Day! 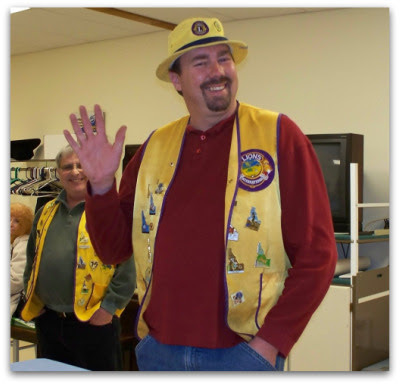 Let everyone know you are proud to be a Lion-wear your vest, logo shirt, or pin and spend some time talking to your friends and co-workers about Lions Club and why you are a member! Now, Therefore, I, C. "Butch" Otter, Governor of the State of Idaho, do hereby proclaim that January 13, 2010, be IDAHO LIONS DAY. 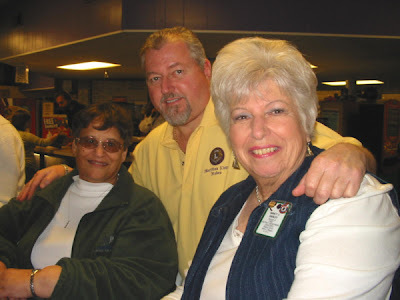 The Mountain Home Lions Club is having their Charter Party on January 15 at the American Legion Hall in Mountain Home. 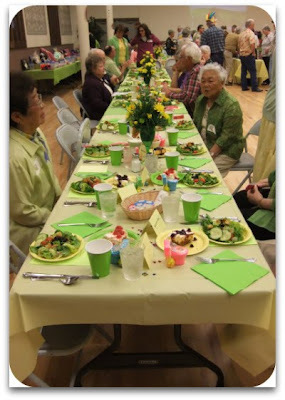 Social hour begins at 6:00 pm with dinner at 7:00. There will be raffle items, door prizes, an auction, skits, and entertainment. It's only $9.00 to attend-so load up the car for the drive and have some fun with the Mountain Homes Lions. Even our largest club appreciates your support! RSVP to Lion Bob Roberts at 587-5322. I started off my year with a visit to the Boise Bench Lions Club today. No reason, just wanted some Mexican food and to say "Hi" to some of my friends there. It seems like I usually go visit there when I want something, but today I decided not to be a pest and just be quiet. The point is, you don't have to have a reason to visit another club. And I don't know about your club, but my club is always excited to have a guest. So make that one of your New Year's resolutions-"I hereby resolve to visit other Lions clubs-to promote, to share, to educate, to network". Or just to have some Mexican food. There are several volunteer opportunities this month, starting this week. Lions are needed to help with hearing and vision screenings in Nyssa on January 5, 6, and 7 and in Boise on January 12 and 21. Contact Lion Ren Gardner for more information or if you can help. 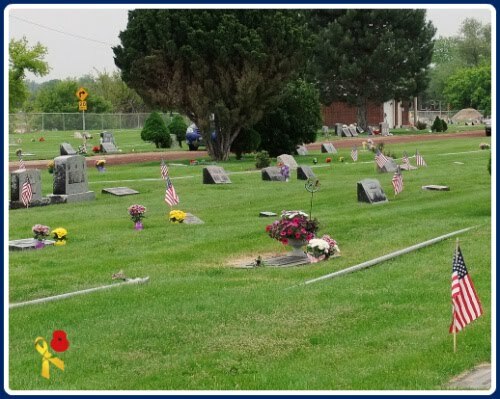 Volunteers are also needed in Kuna on January 13-15 and 18. Contact Lion Jack Graham. Don't worry if you have no experience-there will be something you can do. Edit: Nyssa screenings have just been changed to January 19-21.